Brave, bold, beautiful & bulletproof! Wonder Woman is an Amazonian princess. Member of the Justice League, and DC Comics' most famous female super hero. This all-new miniseries will explore Wonder Woman's various guises, from traditional outfits to exciting one-off looks, while uncovering what each means for the character. 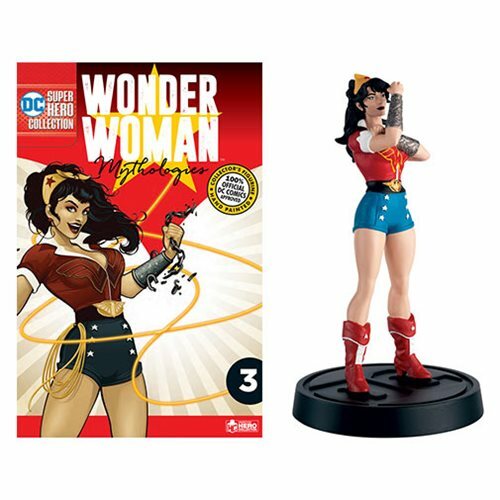 Each figurine has been hand painted and produced in high quality metallic resin, is finished in a retro-style blister packaging, stands approximately 5" tall and is accompanied by a 12-page magazine. DC Wonder Woman Mythologies Divine Armor Statue & Mag.